I've ridden a shaft driven bike once, when biking in deserted mines in Limburg.‡ They used shaft driven bikes because the mines are damp, and a shaft can be enclosed completely, protecting it against the moisture. I like the clean look of a shaft driven bike, as opposed to a chain driven bike. So I'm interested in getting one. But I found some information (Dutch) that hints at a shaft being a bad choice for a drive train, due to high wear on the gears. Does anyone have experience with riding shaft driven bikes? Is the wear on the gears that bad? Are there any other issues I need to be aware of? ‡ An experience I can recommend to everyone. With a dynamo fed headlamp, if you stop, it's pitch black all around you. I used the term "cardan shaft" in an earlier revision of this question, but I think now that use was incorrect. 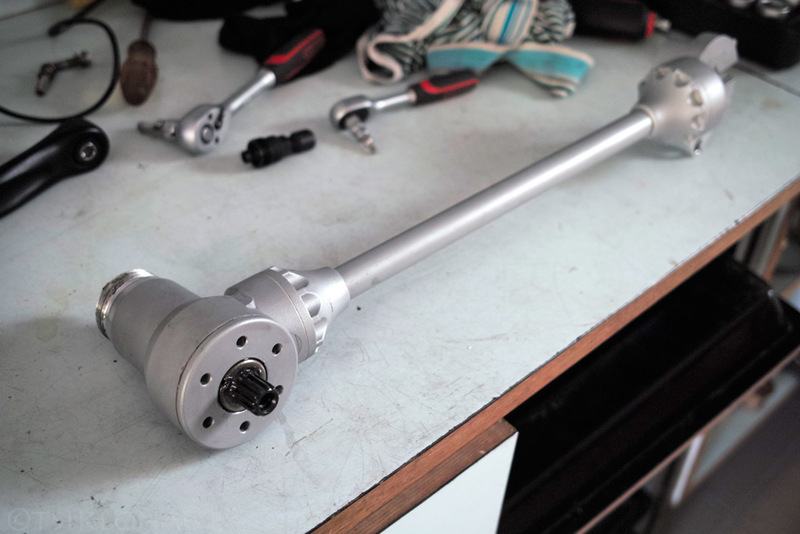 A cardan shaft seems to be a shaft that transfers rotation at an angle, using two universal joints. Drive shafts in bikes usually use gears. "Cardan" however, is not a brand name. I own & ride an XDS COM10 2014 bike. This is fitted with a Sussex (Taiwan) shaft drive transmission & Shimano Nexus 8 speed hub gear. I have used it regularly for over a year & travelled about 4000km on it without any issues . It works perfectly, smooth & quiet.I thought it was very reasonably priced at about AUD700 brand new on-line. It is very similar to ride as a Trek S500 2007 Nexus 8 speed chain drive bike I own, only without the chain maintenance. I intend to fit it with Shimano Roller brakes like the Trek S500 which would make it about as maintenance free as one could get with a bike. Downside would be the proprietary nature of the shaft drive system but it appears to be a high quality product & I think it will be durable But I didn't pay that much for the bike anyway & bought it because of the unique factor. The front drive is totally sealed, the rear drive well protected & both are well lubricated. It is the same system used for more than 20 years by Dynamic Bicycles USA. Removing/replacing the rear wheel is easy & easier than the chain drive Trek bike. I note that there is plenty of negative opinion about this type of bike but it seems to come from people who have not actually experienced using them, which is disappointing as I think they have a lot going for them for recreational/commuting use, as do internal hub gear bikes in general. I don't think I've ridden that particular brand but I have ridden a couple (one flex, the other rigid). My experience was that on one bike especially I could feel the shaft wind up under power, which made me reluctant to apply full power (breaking someone's expensive shaft drive bike is a bad idea). very high torque meaning heavy parts are required, and shaft wind-up may be detectable to the rider. usually cannot change the gearing, what's designed in is what you get. Edit: I have seen internally geared hubs fitted so you can get multi-gear shaft drives, but you're still locked into that particular model hub gear (you can't swap the 3 speed hub gear for a 5 or 8 speed hub gear). unusual design makes servicing harder, and replacement parts may not be available. The slop that the article complains about is not necessarily a problem by itself. But in that case it's an indication of premature wear, which is a problem. Some slop is inevitable, and old shaft drive bikes used to be designed with considerable slop and were quite wear-tolerant as a result. They traded efficiency for that, but it meant you got a bike that worked ok, and kept working ok for 20 years. Another problem is that the parts that are wearing are not mass market parts, they're short-run precision made out gears using hard to work material (and they're cast then machined, which is expensive by itself). That translates to expensive. By comparison bicycle chain is almost a commodity - it's made by the kilometre by several manufacturers, so it's cheap and there is effective competition. A common alternative is the full chain guards often seen on European bikes. That gives most of the benefit of the chain drive but using common bike parts in a way that any bike shop can service. It doesn't work as well, IMO, but a service interval of 10000km or so is better than an exposed chain and IMO a good compromise between cost and durability. As this question suggests a major benefit of chain oil is preservation rather than lubrication. I have a shaft drive bike. I have ridden in Australia about 7,000 kilometres (4500 miles) and so far no problems. I recently serviced Shimano 8 speed hub & inspected geartrain, all are in good shape, run smoothly. I like the bike, its a BMW without engine. Ten or so years ago I purchased a Dynamic Bicycles shaft drive bike with internal hub (Alfine 8) for my year-round commuting in Cleveland, OH. With a chain there, in the winter, it meant a complete cleaning at least once a week, as they use a lot of salt and sand. I tried many different lube options with chains, but with little difference in practice. At first the shaft drive bike was great, but at about 500 miles a noise in the front gear case began, and it got progressively worse. The folks at Dynamic were very helpful, but their conclusion wasn't encouraging. At that time, at least, the front gear case only had grease in it, and they said that under high pedal loads the grease would get forced out of the gears, resulting in the noise. I am hardly a world-class pedal monster, 6' and 185 lbs, and that answer did not impress me, as someone who was such a cycler would ruin this thing in short order. I kept the bike for a time, opening the case and re-greasing the gears whenever they started to make noise, but that ended up being almost as much work as the chain had been. For some reason I never had any problems at the hub end. They agreed to accept a return of the bike, and they told me that they were working on an oil bath system for the front gears. I was very interested in that, and volunteered to be a tester if they needed one, but I never heard anything more about that from them. However, I also never went back to their site to check. Given the design at that time, I don't see how it could hold up to anything but light use, as there was no mechanism to move the grease back into the gears, and use would unavoidably force the grease out. From a road crud maintenance perspective, though, it was a dream. I had high hopes for it, and also looked into other shaft drive options at the time (there were two, if I recall correctly). None of those folks recommended it for what I was doing, though. My dream commuter bike would be one with a Pinion transmission and a shaft drive, but somehow I think I shouldn't be holding my breath waiting for one to show up. Update...I have now covered about 10,000km on my XDS shaft drive bike in about 2 years with no problems. No evidence of wear was visible when the drive system was recently dismantled & no unusual noise or play in the system. Everything working just fine so I'd say the long term prospects are good.The front bevel gear system is sealed & runs in EP transmission oil, the rear gears are enclosed & coated in EP grease.....the bike is now fitted with sealed Shimano Roller Brakes....the Nexus 8 speed hubgear is also a sealed unit....a low maintenance bike & very easy to live with. I totally agree that the proprietary components would be close to impossible to source, these are the frame and the shaft drive system. I do have access to a complete spare shaft drive system which is a plus.....but I think that part could be the most durable part of the bike. All the other bike parts are readily available standard components so not an issue at all. In fact they could be used to construct a conventional chain drive hubgear bike with an appropriate frame. It seems the opportunity to purchase these bikes has almost gone.....I believe they are no longer in production. Sussex Enterprises Taiwan manufactured the drive systems, moved to China & later disappeared. Dynamic Bicycles USA, a main player in this area no longer manufactures or sells this type of bike. Not sure about XDS, maybe just selling existing stock. I'm pleased with my purchase....it wasn't a big investment but it exceeded my expectations for recreational use. I also have the Dynamic Tempo. It has the latest 4th generation Sussex shaft drive, which is an excellent idea in itself but I think is a bit flawed design due to glued gear half-casings on both ends of the shaft tunnel. The factory original glue is weak and can crack in time with frame flexing making the gears go loose under enormous pressure and thus out of alignment (and I think it's what happened to above user experience with broken gears). Mine was OK for exactly 1250 kilometers since new, then the noise came while pedaling and grew exponentially stronger. I was very dissapointed indeed, since I love the system and the bike but expected this part to last at least more than 5K before any wear problems might occur. 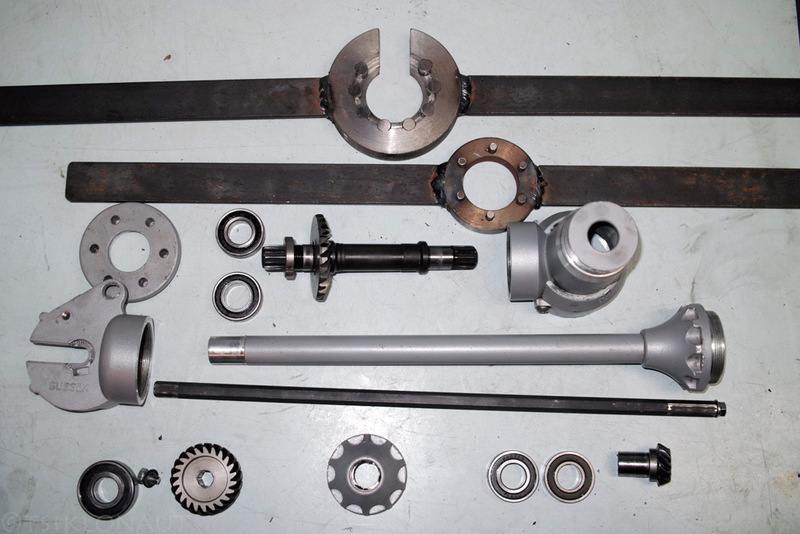 I built myself a specialized tools for it and completely dismantled the Sussex shaft drive. Found the probable fault was the loose glue that loosened up the rear gear under pressure from the frame flexing. The problem is you can't weld it together to perfect the design since the gear casings are rotationally tightened on both ends, so it's hard to find the right angle fitting on the bike, hence you have to glue them at the same time you put it together and mount it on the bike making it a very fiddly job in practice. I'm thinking welding one side of the shaft tunnel permanently and leave the other with glue so I can tune the right angle to fit on the bike yet preserve much better rigidity against possible flexing damaging the glue. I also replaced all the unknown brand bearings inside to high end NTN quality bearings. Once I finish my "Sussex improvement project" I'll see how it changes the game in terms of reliability, come spring. Visually Brik and Beixo bicycles used Dutch-built shaft drive is a better shaft casing design, ditto the older 3rd generation Sussex drive, since they all have the both gear half-casings fixed with 4 bolts on a fixed angle, hence the shaft tunnel is better fixed on both ends and you can weld the tunnel itself onto half-casings. It may not look as good and elegant as Sussex 4th gen drive, but from my experience it's a more practical design idea. Overall I find the shaft drive a godsend, since I'm sick from chains and oily sprockets having them bringing dirt, noise and misery all my life so far. Thus I will keep on using and preferring shaft drive bicycles (and motorcycles) but at the same time I hope some clever engineer does a proper job designing and building a complete and perfected shaft drive system that compensates the current design downfalls - it's very doable, just needs a tiny bit more thought to perfect it. On the Brik/Beixo shaft design what concerns me is the shaft tunnel taking more frame-flex loads (it's an integrated supporting part into frame unlike Dynamic that has a separate full sideframe supporting it and it still flexes), but if they make it rigid enough by design I think Brik/Beixo is close to perfection, Protanium shaft-drive prototype looks very promising, but I haven't heard they ever released that bicycle. in any case, with so many good IGH gearboxes coming into market recently (Rohloff, Shimano Alfine/Nexus 8) even with a bit of sour experience at first for me the future definitely looks bright for the coming shaft drive systems. I've had two of these bikes since 1997, but I have changed gear in the crank once during that time. The earlier layout with the shaft inside the frame made the gears to go out of alignment due to flexing of the fram causing the gears to wear. And now have not been able to source this gears and the production have moved to mainland China, and their mailserver bouncing my mail. So I think Sussex shaft gears are gone completely. I came to this site while searching for a "Sussex shaft drive" replacement. I bought a bike, something called "dynamic tempo," in 2014. It has been great, up until yesterday. While riding it, the pedal seized. I opened it up today, and a couple of gear teeth are broken. So it lasted just under 3 years. Very useful information from Margus regarding the detailed assembly of the Sussex shaft drive. I wasn't aware the tube and end assemblies were fastened with an adhesive. I thought they were a press fit or threaded. Maybe it would be possible to drill & tap the end pieces, and fit some set screws to secure the pieces. I had cause to dismantle the front gear box which seemed to be noisy....that was only partly the problem. The main problem was actually a faulty pedal bearing, but there was some noise from the gear assembly due to incorrect lubrication. The gear box had been assembled with grease & not gear oil,when filled with EP gear oil it was noise free. There are no effective oil seals on the spindle so it tends to leak through the crank bearings....I just overfilled it & eventually it found the correct level, and I just put an occasional shot of oil in the filler hole. The rear gear assembly needs a regular application of grease otherwise it starts to become quite noisy & rough. Apart from these issues it is still working fine. I got an almost complete spare shaft drive assembly from the XDS Australia importer. There were a couple of missing parts but I was able to purchase these from Dynamic Bicycles USA (Patrick Perugini). They were still holding spare parts for the range of Dynamic bikes they used to sell, probably the only source of parts for these transmission systems. Sussex Technologies left Taiwan and went to China operating as Sussex Goodman (Taichang), part of Goodman Machinery Company. They did respond to emails for a while and then disappeared (d.xu@g-d-m.cn). XDS stopped offering their range of shaft drive bikes, which they listed as XDS Direct Drive so I assume the transmission systems became unavailable. XDS Australia no longer list the range of bikes, they were products handled by Lifespan International and sold on eBay. Maybe they still have some stock if anyone is interested. They are very interesting pieces of machinery. Not the answer you're looking for? Browse other questions tagged drivetrain shaft or ask your own question. Are chain-drive gears 'ridiculously' efficient even when dry of oil? Why do bikes have their drivetrains on the right? Why are there almost no bikes with a single chainring? Have there been designs of bikes with stepless transmission? Which will wear longer, a single chainring with 11-speed cassette, or triple chainring with 8-speed cassette? Will Deore M6000 SGS derailleur work with 42t cassette in 1x10 configuration? Could I have enough chain retention on a 1X system with just a narrow wide chainring without a clutch?